Topic: I think there needs to be a poster to get the word out... any thoughts? Re: I think there needs to be a poster to get the word out... any thoughts? I think the greatest world-wide exposure we can possibly get is on these forums. If you see a post from someone in your area, or any area where you think riders are needed, throw in a high-jack post, telling them about the relay, with a link here. I agree. Now that you mention it, there are many car events that happen within 20 miles of me that I never hear about. I usually find out after seeing hot rods motoring down the highway past my small town. I never would have heard of the annual VW bus event at Jerome, if not for a friend who was one of the officers of the hosting club at the time. He convinced me that I HAD to take my MoPar V-8 powered bus, regardless of how it looked. I did the "Jerome Jamboree" event several years, and always had a good time. Any way you can get folks interested in our relay is a good idea! Axehole just got himself appointed posterman That's a good idea. Maybe someone can do a design with the logo as soon as voting for our mascot "IT" is concluded. Post up the file then any member can download it, print it out and post it at their favorite location! I just love this place What a great bunch of guys and ladies! There's 4038 people online right now at ADVrider. I think we should solicit over there, anyone a member? There's bound to be a few soch'ers. Maybe in the Old's Cool section. Yes.......post on other boards!...............Could we get a poster design on this page that could be downloaded and printed by members for posting at thier local hangouts? All it has to say is the T-Shirt logo and something like.....riding near you.....get involved.....look for the rider schedule on www.soch4.net...........Open to all Honda sohc/4 bikes. Neither: 413 wedge midships, mounted low. Lots of fun! Could we get a poster design on this page that could be downloaded and printed by members for posting at thier local hangouts? All it has to say is the T-Shirt logo and something like.....riding near you.....get involved.....look for the rider schedule on www.soch4.net...........Open to all Honda sohc/4 bikes. Excellent idea! We can print flyers and place them in our local bike shops and hangouts. 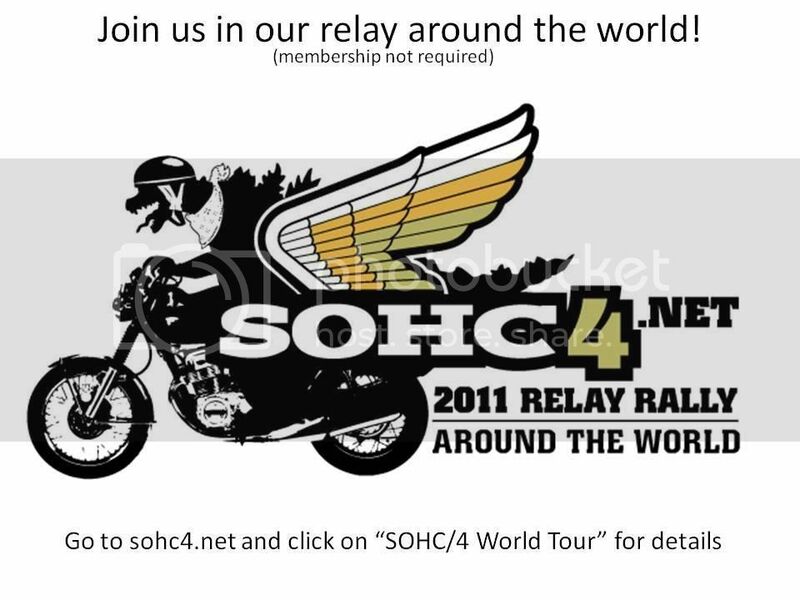 Maybe a short explanation of what sohc/4 is, where to find us on the web, what the relay is about, and a place for dates "coming through this area" left blank, that we can fill in by hand. Going to start working on something this weekend I think I have a family friend that happens to be a VERY good artist I may see what it would take to make a special graphic for it incorporating "IT" and maybe some kind of cartooned action scene he does most of the car show posters in my area in a very Big Daddy Ed Roth kind of style... really pops Examples below EDIT: OR AM I'M OVERTHINKING THIS? Great idea there rider #169. Not overthinking at all. Icing on the cake. Hey Travis, my printer drinks ink!! To print enough flyers in color would break the bank! If a link is posted to the poster then we all can download it and print however many we need (unless you're going to distribute a #$%*load). Do you think that might work? Or that link could be used at the print shop. It doesn't have to be fancy, maybe a smallish logo at the top, in color, with a large font banner announcing the Relay. The rest of the text can be smaller, but should still be large enough that the older riders can read it. Keep ink conservation in mind. The idea is everywhere, but where is the poster? I'll be out and about on my bike this weekend. It's supposed to be nice (mid 60's) around me! I'm going to the local Honda shop after work so it'd be nice if someone could come up with something before 4:30pm CT so I can use my printer at work. I don't have one at home. I just made it in powerpoint and then saved it as a jpeg. (I can help you with that if need be) I just tried to attach the powerpoint but it wouldn't let me. I can try to email it to you, or I can post how to do it in powerpoint. If we have expenses for the log book, the banner, and poster artwork...........I think we could cover it with a $1 donation by every rider (now at 199) that signs the log. The money could be carried in the log book and collected by each corrordinator or designated border-crossing rider, and sent to Jerry for a final accounting. If we are short, the investors would be equally short-changed...........if we have a surplus, we could give it to a charity or send it to Glenn for the web-site. The dollar might be a bit of an issue for us Canadians eh?